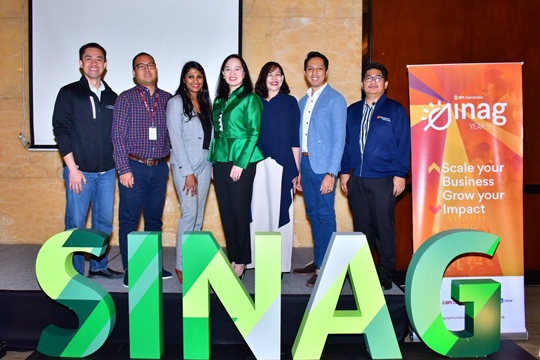 BPI Foundation, the social innovation arm of the Bank of the Philippine Islands, is once again on the lookout for 10 of the country’s most promising social enterprises as it announces the launch of BPI Sinag Year 5. From left: Start-up Village director Carlo Calimon, BPI Direct BanKo regional area manager Carlo Ragaza, Villgro Philippines chief executive officer Priya Thachadi, BPI Foundation executive director Maricris San Diego, Business Banking vice president Jessymel Cruz, Globe Citizenship Team head Miguel Bermundo, and Bayan Academy for Social Entrepreneurship and Human Resources executive director Philip Felipe at the launch of BPI Sinag Year 5. To reach more social enterprises around the country, BPI Sinag will hold roadshows in Davao, Iloilo, Pampanga, and Laguna. At these roadshows, social entrepreneurs can present a seven-minute business pitch to fast-track their entries and be shortlisted as one of the top 40. The top 40 will then participate in boot camps, which will include trainings on business strategy and planning, marketing, operations, finance, organization and HR development, and social innovation, among others. Ten social enterprises who are best able to showcase their business viability and social impact will be named as awardees of BPI Sinag, with the top one to five receiving P500,000 and top six to 10 accepting P100,000 cash grants. Other awards are Online People’s Choice Awards with P20,000 cash grant from BPI Business Banking, Most Viable Social Enterprise Development Plan Award with 50,000 cash grant from BPI Business Banking, Negosyo Ko Award with P20,000 cash grant from BPI BanKo, and Tech for Good Award with P100,000 worth of Globe services from Globe Telecom. Mentorship opportunities will also be given to two social enterprises by Start-up Village. It is open to social entrepreneurs who are 18 years old and above and have been operating their social enterprises for at least two years. Applicants may go to www.sinag.bpifoundation.org to download the application form and submit the accomplished form to [email protected] Deadline for entries is on May 27.